The West End is rife with magic shows at the moment and The Illusionists is one of the best around! Having wowed audiences in New York, the show swoops into London's Shaftesbury Theatre for a limited run between November 14th and 3rd January 2016. 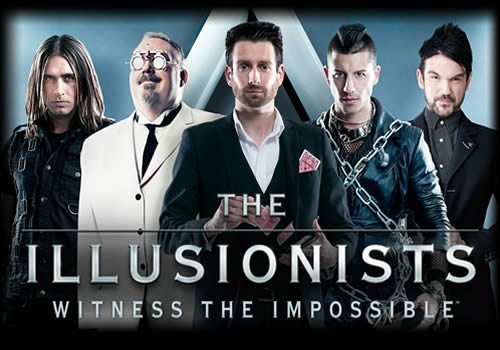 The Illusionists is a all encompassing theatrical extravaganza featuring five specialty performers; The Magician, The Escapologist, The Inventor, The Deductionist and The Warrior. Ooh! Britain's got talent runner up, Jamie Raven, portray's "The Magician." Raven wowed the BGT audiences and judges with his "lemon trick," and one can only imagine what he has up his sleeve for the audiences at the Shaftesbury Theatre. Andrew Basso is "The Escapologist," and is the only person in the world to be able to perform Houdini's Water Torture Cell Trick with no covers. Audiences will be holding their breath as he gets to work in one of the show's most dangerous tricks. Kevin James is "The Inventor," and provides some comic relief to his show with his whimsical blend of quirkiness and illusion. Ben Blaque is "The Warrior," and claims to be the only performer in the world to attempt his style of performance. The Warrior uses archery among other impressive skills to wow the audience. Colin Cloud is "The Deductionist," a mind reader and problem solver. Described as "potentially one of the most dangerous men in the world," Colin will leave the audience convinced he some kind of higher power. All in all, The Illusionists promises to be an intense but wildly enjoyable evening of illusion which may very well bend the fabric of your mind! The Illusionists advertises itself as a family show.